The coast off north-east Greenland is a grey, cloudy, and icy place. I spent 4 weeks on a ship earlier this summer to place sensors on the ocean floor to measure water currents, salinity, and temperature. The data shall uncover the mystery of how ocean heat 300 m below the surface gets to glaciers to melt them from below year round. My contribution is a small part of a larger effort by German, Norwegian, Danish, American, and British scientists to reveal how oceans change glaciers and how oceans impact Greenland’s ice sheet, climate, and weather. 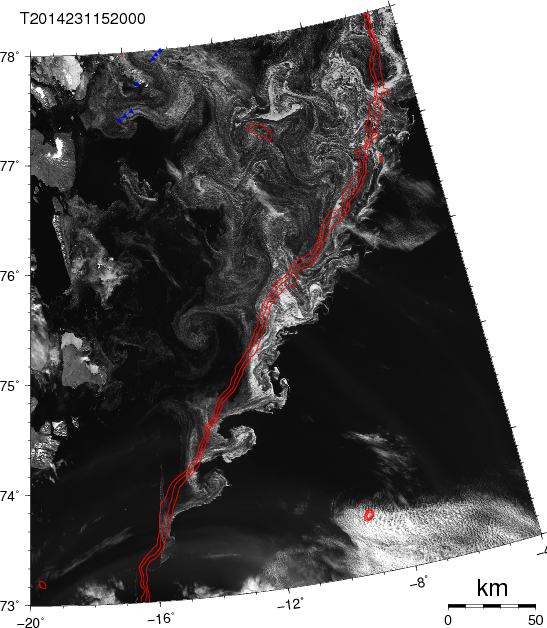 Satellite image of ocean current instabilities on Aug.-19, 2014 as traced by ice along the the shelf break, red lines show 500, 750, and 1000 meter water depth. Small blue triangles top left are ocean moorings. 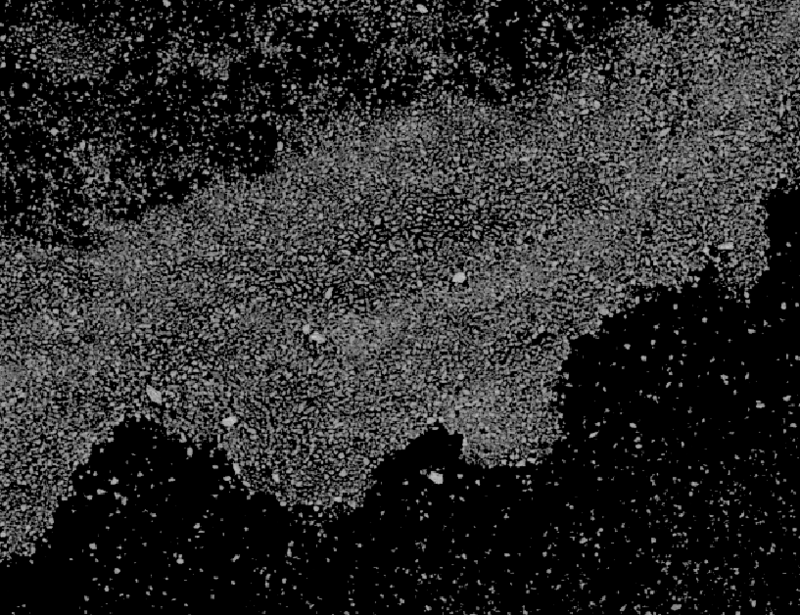 Individual ice particles as seen on the north-east Greenland shelf from LandSat 15-m resolution from Aug.-21, 2014 near 77.5N and 10 W.
Strongly white areas indicate convergent ocean surface currents that concentrate the loose ice while divergent ocean currents spread the ice particles out in filaments and swirls and eddies. Notice how the large crests seaward of the red line between 74 and 75 North latitude grow and appear to break backward. This is an instability of the underlying East Greenland Current. It starts out as a small horizontal “wave,” but unlike the waves we watch at the beach, the amplitude of this “wave” is horizontal (east-west) and not vertical (up-down). The mathematics are identical, however, and this is the reason that I call this a wave. As the wave grows, it become steeper, and as it becomes too steep, it breaks and as it breaks, it forms eddies. These eddies then persist in the ocean for many weeks or months as rotating, swirling features that carry the Arctic waters of the East Greenland Current far afield towards the east. The East Greenland Current, however, continues southward towards the southern tip of Greenland. The wave and eddy processes observed here, however, weaken the current as some of its energy is carried away with the eddies. I could not find any imagery like this in the scientific literature for this region, but similar features have been observed in similar ocean current systems that transport icy cold waters along a shelf break. The Labrador Current off eastern Canada shows similar instabilities as does the East Kamchatka Current off Russia in its Pacific Far East. And that’s the beauty of physics … they organize nature for us in ways that are both simple and elegant, yet all this beauty and elegance gives us complex patterns that are impossible to predict in detail. This entry was posted in Greenland, Oceanography, Uncategorized and tagged continental shelves, eddies, Greenland, turbulence. Bookmark the permalink. Hi Andreas, I have been following your blog for the past couple of years since a trip to Antarctica in 2012/3. I am an artist and am interested in following the journey of icebergs that originate from the antarctic ice. Which organisation tracks and monitors icebergs visually/ by satellite, and is it possible for members of the public to also do this? Thank you for the kind words … and no, I do not have the Antarctic ice-berg tracking web-sites or data distribution at my finger tips. It is a very different community than the ocean physics, observing, and education community.